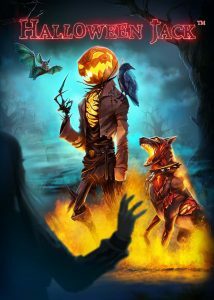 Halloween Jack video slot is an October 2018 release that takes you right at the heart of a hunted cemetery. Indeed, this game is packed with creepy and iconic symbols that are all designed to make you win big since the paytable of this slot is on the higher end of the scale. Which means that despite its theme, Halloween Jack will most certainly become a fan favourite all year around. In fact, this slot offers an excellent max win of 600,000 coins and crowd-pleasing features that are in other top performing NetEnt games. Plus, it’s a high volatility slot. So, it’s an excellent game to play if you’re looking to get your heart pumping with big wins and if you play with a casino bonus. Suitable for: Cautious players, Everyday pleasure seekers, and High Rollers. First of all, let’s talk a bit about the base game features since they’re the first ones you’ll trigger. If you’ve played Jack and the Beanstalk before and liked it, you’ll feel right at home when playing Halloween Jack. In fact, this game too offers Walking Wilds with Re-Spins in the base game. Except that in Halloween Jack, the Walking wilds symbol is, of course, a jack-o’-lantern. Undoubtedly, the Free Spins bonus is where you’ll experience the biggest win, since very much like its less creepy cousin, Jack and the Beanstalk; you’ll have the chance to unlock extra features by collecting symbols. In Halloween Jack, you’ll need to collect Lantern symbols and here’s what they’ll give you. 3 Lantern symbols give you a Mini Stacked Wild (Hell Hound). 6 Lantern symbols will trigger a Full Stacked Wild (Jack-o’-lantern). 9 Lantern symbols will also trigger a Full Stacked Wild (Death Reaper). As always any wild symbols that land in view will move from left to right as a Re-Spin is triggered. Also, it’s worth knowing that you can have more than one Stacked Walking Wild in play during the Free Spins. And finally, you’ll also want to know that during the bonus rounds your winnings are 3x. After close analyses and as you probably guessed it by now, we have high suspicions that this slot is a modernised version of another top rated game by NetEnt. Yet, it’s not a bad thing since the original slot had a less mature theme. Plus, the child-friendliness of the original game means that this high performing game was hard to promote in the UK. So did NetEnt give us a trick or a treat for Halloween? We’ll let you be the judge! Try this game now and see what you make of it! Reskin or not it’s still a great slot to play, so have fun!